Sale Ends 09/22/2014 @ 11:59PM ET. Naked Lunch is one of the most important novels of the 20th century, a book that redefined not just literature but American culture.This is an unnerving tale of a narcotics addict unmoored in New York, Tangiers, and, ultimately, a nightmarish wasteland known as Interzone. The restored text includes many editorial corrections and incorporates Burroughs’s notes on the text and several essays he wrote over the years about the book. For the Burroughs enthusiast and neophyte alike, this is a valuable and fresh experience of this classic of our culture. 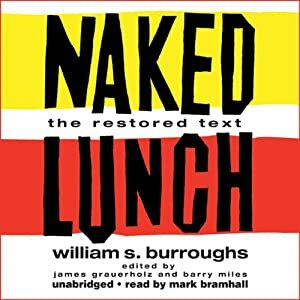 ©2001 William S. Burroughs Trust; (P)2009 Blackstone Audio, Inc.
Naked Lunch is brutal. A brutal, nasty, savage look at humanity through the eyes of one of the premiere cultural icons of the 20th century and beyond. A classic, the book isn’t for the faint of heart, but if you are a lover of all things amazing prose, it is not a book to overlook. Especially with the gut-wrenching narration of Mark Bramhall grabbing you by the collar and dragging you down, down into the darkness and the smells, the pain and the nightmarish reality of the ruins of a life. Williams S. Burroughs, Jack Kerouac and Allen Ginsberg are the definition of the beat generation, of a time which stands alone in the annals of narrative history. Add in the gonzo of Hunter S. Thompson, the back beat of the words of Laurie Anderson, the rythms of Frank Zappa, Adrian Belew and the Talking Heads, and you have a picture of my life, my mind and soul, during the most important periods of my life. In my mind, the greatest of the prose-masters is Burroughs, no matter what others may say, and his mark on the landscape of the written word is unmatched. Yes, brutal, savage – but real and true on levels that few authors ever reach. With all the talk about all the modern books out there, sometimes it is hard to remember that there are authors that came before the days of electronic books and instant delivery that are well worth enjoying again. The great Agatha Christie, need I say more? This was one of my favorites as a child. A train journey from Turkey to France is delayed by thick snow. So when a passenger on the train is found murdered in his bed, it is the perfect opportunity for Agatha Christie’s famous detective, Hercule Poirot, to prove his ability and solve the crime using the power of his brain. I hid under the covers as the call of the Hound wafted across the moors….. The Hound of the Baskervilles is the third of the four crime novels written by Sir Arthur Conan Doyle featuring the detective Sherlock Holmes. Originally serialised in The Strand Magazine from August 1901 to April 1902, it is set largely on Dartmoor in Devon in England’s West Country and tells the story of an attempted murder inspired by the legend of a fearsome, diabolical hound of supernatural origin. Sherlock Holmes and his companion Doctor Watson investigate the case. This was the first appearance of Holmes since his intended death in “The Final Problem”, and the success of The Hound of the Baskervilles led to the character’s eventual revival. Horror was my familiar. Published the same year as her first novel, Adam Bede, this overlooked work displays the gifts for which George Eliot would become famous—gritty realism, psychological insight, and idealistic moralizing. It is unique from all her other writing, however, in that it represents the only time she ever used a first-person narrator, and it is the only time she wrote about the supernatural. The original Oxford Worlds’s Classics with 1818 text. Frankenstein enjoyed immediate popularity upon its publication, and has inspired many imitations and versions, including many film versions in the 20th century. She wrote it when her husband’s friend and associate, George, Lord Byron, suggested that each of the three (Percy Shelley, Mary Shelley and Byron) each write a ghost story. She wrote several more novels and some short stories, with historical, Gothic or science fiction themes. She also edited an edition of Percy Shelley’s poems, 1830. She was left to struggle financially when Shelley died, though she was able, with support from Shelley’s family, to travel with her son after 1840. Her biography of her husband was unfinished at her death. The book notice from SweetFreeBooks.com that got me to thinking about books I loved as a child. A sawed-off shotgun blast to the face leaves one man dead – and reveals a secret that has pursued another across an ocean and set the world’s most ruthless criminal on his trail. The man needs the help of a great detective…but could even Sherlock Holmes save him now?